Focused on conquering stage fright, designing compelling slides, and creating an impact, the workshop is structured around exercises and activities that improve the public speaking experience for both the speaker and audience. Free and open to students and alumni of the University of Redlands School of Business and School of Continuing Studies, the event is being repeated at the University’s Temecula, Burbank, and South Coast Metro campuses over the next three weeks. 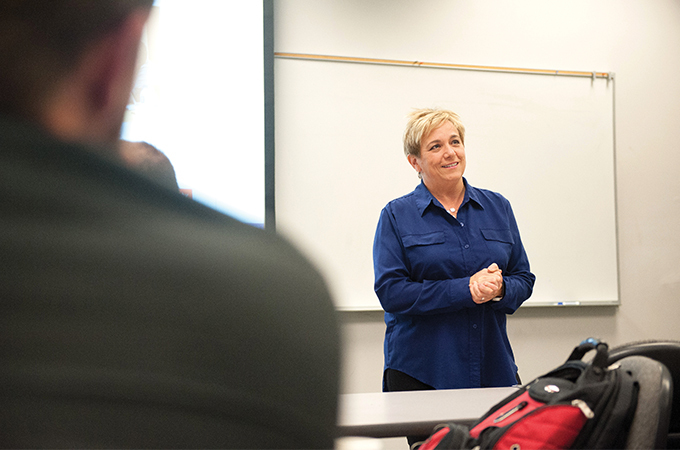 During the September 13 workshop on the main Redlands campus, Fraiberg emphasized techniques that presenters can use before and during a presentation. Since “presentations go haywire when the presenter gets surprised,” Fraiberg recommends that speakers familiarize themselves with the space in which they will be presenting, practice the presentation, and know their audiences. She also stressed the importance of knowing how to operate the technology in the presentation space and of being able to adapt if the location of the presentation changes. Honing your message is also an important part of presentation preparation. In order for people to want to listen to a presentation, they have to care about what is being said. Because of this, Fraiberg said, part of the presentation must articulate what is at stake for the audience. For additional information on preparing presentations that deliver, Fraiberg recommends The Harvard Business Review Guide to Persuasive Presentations. Learn more about the “Presentations that Deliver” workshop. Fraiberg is also offering a workshop titled “Secrets to Writing: Persuasive Reports, Proposals, and Research Proposals” at University of Redlands campuses.